ActiveX controls, formerly known as OLE controls or OCX controls, are components (or objects) that you can insert into a Web page or other program so that you can reuse packaged functionality that someone else programmed. 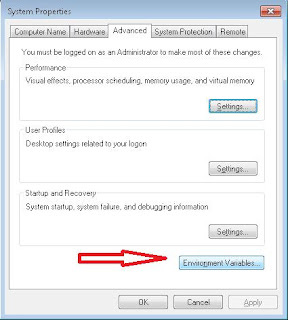 For example, the ActiveX controls that are included with Internet Explorer enable you to enhance your Web pages with sophisticated formatting features and animation. ActiveX is an open integration platform that provides developers, users, and Web producers a fast and easy way to create integrated programs and content for the Internet and Intranets. Using ActiveX, you can easily insert multimedia effects, interactive objects, and sophisticated programs into a Web page, creating a user experience comparable to that of high quality multimedia CD-ROM titles. This control allows you to embed and control the view of PDF's directly in your form. This type of ActiveX control can be inserted into a report or form and bound to data field(s). You can download files directly from the internet to the hard drive, with a progress notification with this type of control. Microsoft Office Document Imaging 2003 (MODI) adds programmability features to the document scanning and viewing tools. 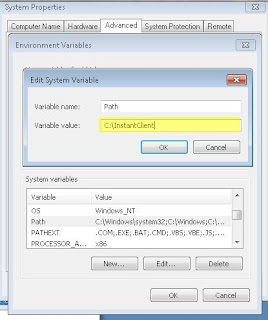 This is a great tool but no longer included with MS Access 2010 (http://support.microsoft.com/kb/982760). 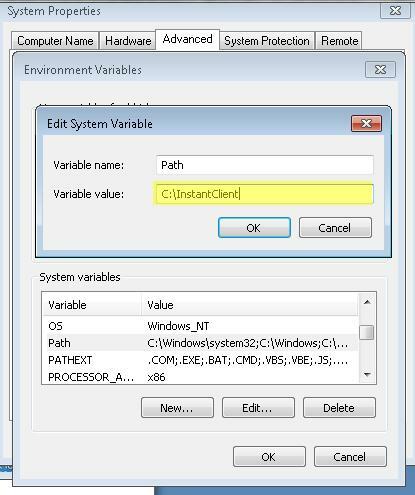 Before using a custom control, it must be registered in your install of MS Access. To do this, open the visual basic editor (Ctrl-G), select "Tools," "References" and "Browse" to your dll or ocx file, and select it. If you have registered the control correctly, in a form or report design mode, select "Design" and "ActiveX Controls" you will see and be able add the control. ActiveX Controls can be controlled by modifying the controls "Properties," or writing event handlers in VBA depending on the control. 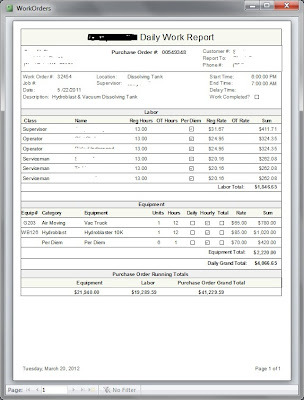 One example of how I have used a custom control is in a data entry application to view embedded PDF's. I added hot-key enabled command buttons on my form that have onclick event procedures to zoom or page through the PDF. I thus give the keyer the ability to quickly, (without using the mouse) control the navigation and viewability of the PDF and thus speed up data entry. Of course we could open the PDF in a separate viewer but we would then have to use the mouse to control the zooming and paging. When you have repetitive data entry, this little option saves time and ultimately, money. If you have the need to add functionality to your application, an internet search will expose many available controls. MS Access is a powerful low-cost business tool that offers excellent ROI and fills many and varied business needs. As the most popular database program in the world, MS Access allows the creation of very sophisticated multi-user applications with a shared back-end data source, simple desktop data manipulation, or adhoc reporting solutions from a variety of data sources. I have not found a data source that I could not link MS Access to including SQL Server, Oracle, MySQL, MS Excel, Word, dBase, etc. Because of this, an Access developer has the ability to develop and deploy real-time front-end solutions that report critical business intelligence from one or more of these sources. These solutions can either be one-offs or custom menu-driven applications that offer the selection of multiple criteria, grouping, sorting and visual representation. With the Access Query Designer, complex multi-table queries can be created. Queries can also use VBA or user defined functions directly in queries for sophisticated analysis and updates. MS Access offers a low-cost solution for handling data and automating business processes. Microsoft even makes available a free runtime that alleviates the cost of buying Access for every end user. For many business needs, MS Access is a cost-effective and powerful tool! I wanted to share an additional option to my earlier blog regarding Sharepoint Attachments. 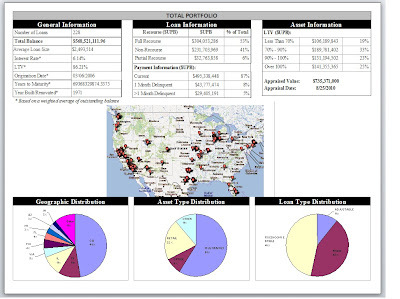 This design shows the flexibility that can be built into an MS Access Web Database. Add CLIENT forms that have an unbound Image Control, place TIF images in a consistent folder on the users computer (I would automate the daily image distribution). Run my custom PopulateImages() function that adds the image names to a field in the table. In the OnCurrent event of the form, set the unbound image control's "Picture" to the image. As my tables are still Sharepoint lists, I still have the administrative advantages of a web database. This is more reasonable for higher daily volumes (remember it took and hour to add 150 images to the attachment field). 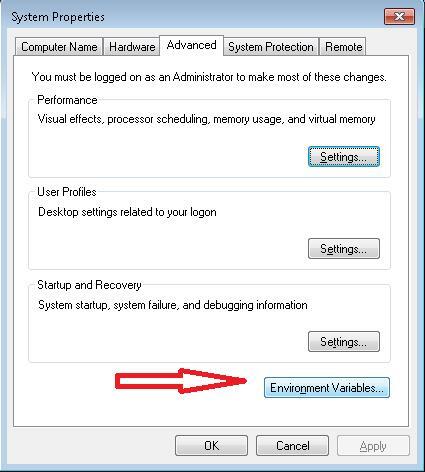 It also gives the advantage of distributing any updates to users automatically whenever they login. Users can use the free MS Access 2010 runtime. Either browser based or client based can be available from the same application. 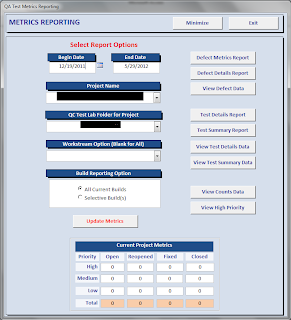 I recently had an adhoc reporting project using MS Access querying Oracle tables via ODBC. Thought I would share the process for anyone that might need it. • Run C:\InstantClient\odbc_install to install the Oracle ODBC driver. Data Source Administrator is 64-bit so if you are running the 32-bit ODBC driver, you will have to specifically run the above file (on my machine it was found at (C:\Windows\SysWOW64\odbcad32.exe). • Click “Test Connection” to confirm set-up. You will be asked for a TNS Service Name, User ID and password which your Oracle administrator can give you. 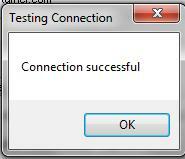 If all is correct you should see a successful connection message. Once connected, I was able to design and run all my reports without issue. I recently tested a project that is a good candidate for MS Access on Sharepoint. It is an ongoing project keying records daily from scanned images and would require at least 3 keyers daily. The advantages are obvious: ability to work remotely, centralized administration, and flexibility to distribute or redistribute work flow. I developed forms with needed validation rules for each unique image that we are keying from. Within the table design (and then forms) I included an attachment field. When an attachment field is added to a form, the first image will show. As I will only add one image per record, this works perfectly for our purpose. strSQL = "INSERT INTO TicketsTbl (ImageName) " & "VALUES(" & Chr$(34) & strFile & Chr$(34) & ")"
NOTE: I set the process running and checked back later and found that adding 150 jpg attachments took one hour. Not real speedy and an obvious consideration that will make this process unreasonable for some projects. I have the ability to run counts, do quality control and give feedback to keyers based on the login information that Sharepoint always captures. The built in fields are "SharePointCreatedDate", "Author", "SharePointModifiedDate" and "SharePointEditor." I always add similar fields to my desktop applications but these are included in any SharePoint list. I found no fully-developed instructions to this process on the web (though I started with a basic outline of the add attachment function from Microsoft) so I'm hopeful that this information will be helpful to some of you. Would love to hear your feedback. 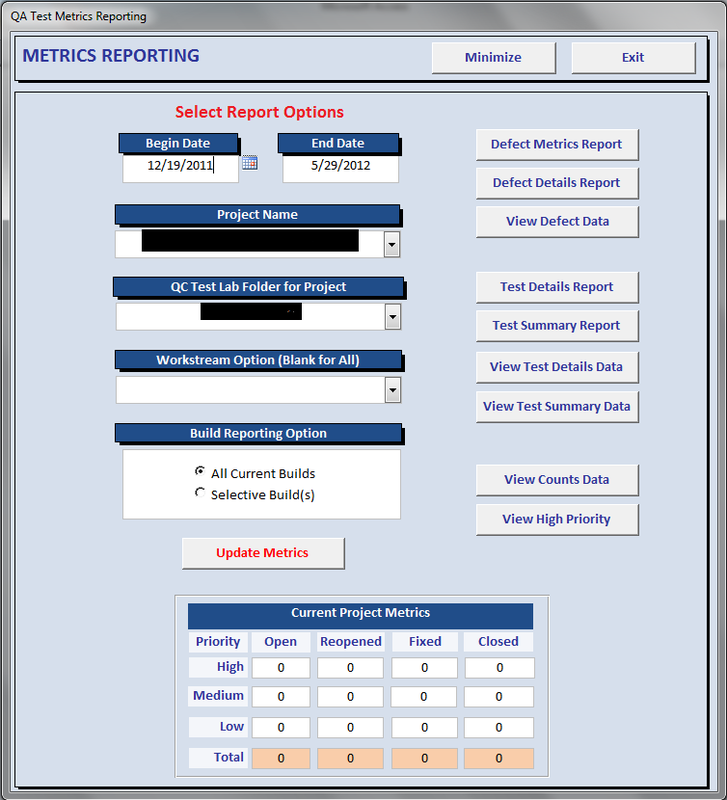 I have been struggling with offering my users a flexible and powerful reporting environment in their Access Services application. In a desktop MS Access database, to give users the ability to select more than one item to apply to a single filtering criteria you can either create a custom interface/fuction with VBA or use a multi-select combobox (or listbox) with VBA. Unfortunately, VBA is not available in Access Services. Microsoft has replaced VBA with expanded Macro capabilities that, while pretty powerful, is not as flexible or powerful as VBA. Nor is a multi-select combobox available in the same way in a web database. I had to think outside the box. In our database we have a table with contacts and a related table with lists that the contacts belong to. I created a list lookup table with the values the users can select to filter their records with the fields: SelectList(s) (Y/N), Lists, ListID. There are 55 possible lists in the lookup table. 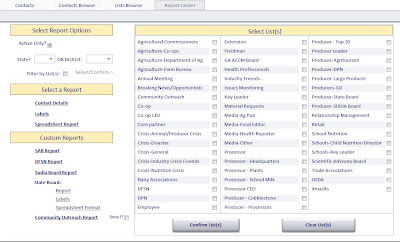 Then I designed a report selection form, placed a subform on it with checkboxes for each list selection. After selecting the list(s) the user desires and clicking "Select Lists" a macro is run that populates TempVars with the for selected list(s) ListID number. I designed a Query that links the Contacts table to an interim ContactLists table that then links to the SelectMultiLists table. I run a datamacro that sets the selected records to YES for the TempVars ListID. I included the SelectList field in the query and set it's criteria to "True" so that only the related records that the user has checked in the subform appear in the results. 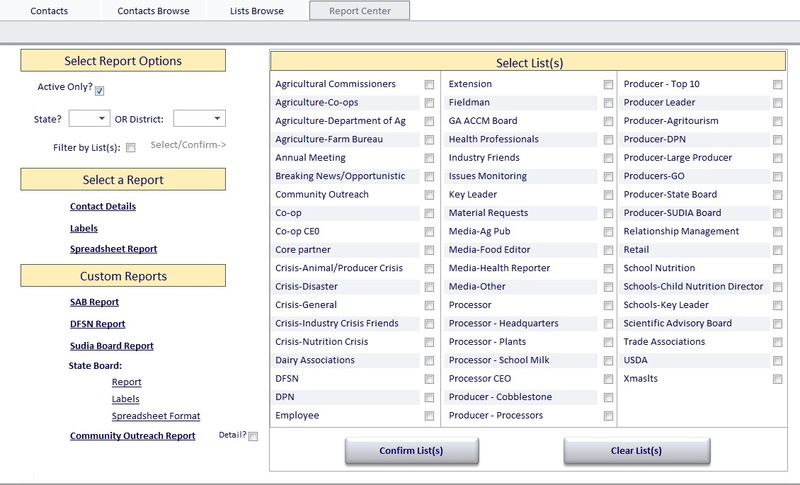 Back on the Report Selection form, after the user clicks the yes/no option to select their criteria, they select the report (I have 4 different report formats including labels and a spreadsheet layout appropriate for export to Excel) they want to run and a macro is run with additional If/Else/Endif structure that additionally filters the report selected. In this way I was able to offer reports on multiple lists and have included 3 additional criteria (state, district, active). 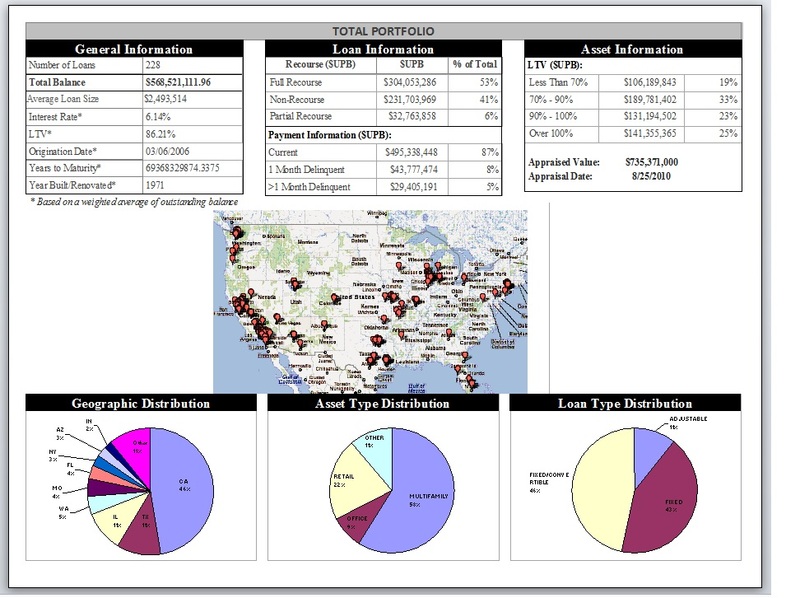 I reviewed the templates Microsoft offers for Web Databases, and the Northwinds Web template and I believe what I have designed has more flexibility/options for reporting all in Sharepoint (don't have to move to the client). Would love to hear your feedback if you have worked with Access Services and can offer better or additional reporting suggestions.